Los Rios Community College District announced through a district-wide RAVE alert on Wednesday that classes across all Los Rios colleges are cancelled through the rest of the week, effective immediately, due to poor regional air quality conditions. The district closure came after California State University, Sacramento, University of California, Davis and Yuba College had already cancelled classes because of poor air quality due to the Camp Fire in Butte County. This is the second day of closures for Sac State and UCD; both campuses were expected to resume classes today but due to student backlash, remained closed, according to the Sacramento Bee. Los Rios campuses have remained open since the Camp Fire started last week. The fire is now the largest and most deadly fire in California history, leaving 63 people dead and over 600 missing, according to CNN. The Spare the Air program monitors unhealthy air conditions all over the United States. The Sacramento region’s Spare the Air website, run by the Sacramento Metropolitan Air Quality Management District, explains what those conditions are in real time. Air quality index (AQI) readings are considered unhealthy if they are 150 or higher, meaning there are particles in the air that can cause health issues or exacerbate existing health problems. The air is considered very unhealthy when the AQI is over 200. At 9 a.m. this morning, Nov. 14, the AQI was 241 and at 2 p.m. it was 181, according to Sacramento region’s Spare the Air site. The decision to cancel classes followed a few hours after an email was sent to students from LRCCD Chancellor Brian King and co-signed by the four Los Rios colleges’ presidents, including ARC President Thomas Greene, addressing the district’s decision to keep campuses open earlier in the week. Before ARC cancelled classes, students, faculty and staff tried to work despite the smoke. 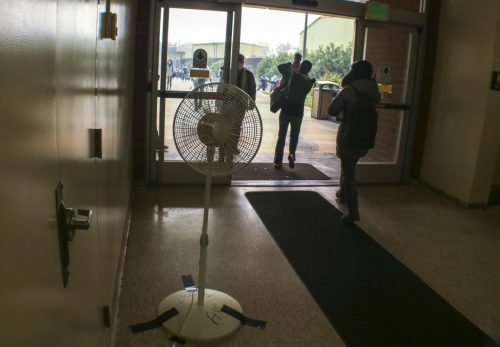 For example, oscillating fans were put in Davies Hall to keep smoke out of the building. 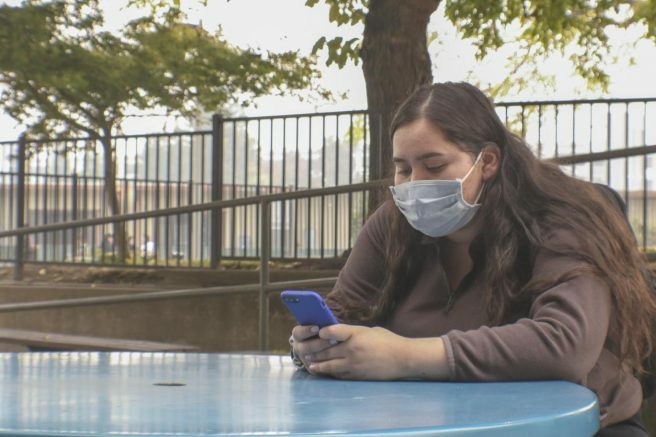 The nursing office was also handing out masks, however, they were not the respirator N95 type masks that the Environmental Health Investigations Branch of the California Department of Public Health recommends, which will filter out small debris in the air. Despite ARC restricting and cancelling outdoor activities, the district’s initial decision to stay open Tuesday and Wednesday was met with criticism from students and staff, as well as over social media. Elizabeth Johnson, a receiving clerk and Vice President of Service Employees International Union, Los Rios Support Services chapter, said she was concerned for her colleagues when the Operations Office did not initially provide workers with masks. According to Johnson, workers were eventually provided with adequate masks today. “I think that they had just not gotten direction that it was something that they had to do,” she said. Prior to the notification that classes had been cancelled, Ray Singh, a culinary and hospitality student, said he wished that professors would not take roll while the air quality is bad. “I would like the school to be closed because it’s terrible outside, but since it’s not I just go to school,” Singh said. According to Crow, classes will remain cancelled and college and district offices will remain closed through Sunday, Nov. 18. The district send out a second RAVE alert Friday morning informing students that they will be notified by 5 p.m. on Sunday, Nov. 18, of the colleges status on resuming classes Monday. This story was updated to reflect new information on Nov. 16 at 10:54 a.m.
Jennah Booth is a second semester student with the Current. She has served as social media editor in the past. Booth has been at American River College since 2015 and received her associate degree in journalism and mass communication the spring of 2018. She plans to transfer to San Francisco State University to pursue her bachelor's degree. Be the first to comment on "Los Rios campuses closed due to unhealthy air quality"